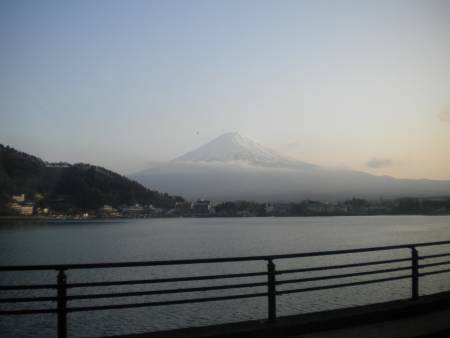 It goes without saying that the Fuji Five Lakes in Yamanashi Prefecture are a popular tourist destination in Japan. 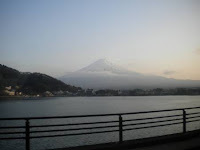 Mount Fuji, visible from as far away as Tokyo and Yokohama, dominates the landscape and is a magnet for visitors. With plenty to do all year round, it's an easy hop from Tokyo and makes for a simple do-it-yourself green vacation. Eager to get out and about, we rented bikes from our hostel and went straight to Lake Kawaguchi to begin the 26 km loop. Within moments we spotted Mount Fuji, rising in all his snowy shouldered glory just to the south. Trees were giving serious thought to blooming, but holding back a bit in the chill wind, and bits of snow huddled next to the bike path in a few places. Herb and rose gardens dotted the shore and looked as though they were mustering up the strength for another year of beautiful blooms and bounty. On the Eastern shoreline, we decided to warm up a bit and check out the art museum. Home to a small but nice collection of Fuji-focused art works and gifts, we enjoyed the art and the mountain in all seasons and throughout history. A number of very cute little cafes also dotted the path as we moved northward along the shore, offering tasty treats and terrific views of the mountain. The Natural Living Center had me nearly leaping from my bike. Fronted by massive lavender beds, the Center offered up some local wares - sake and wine, to be sure - but the little gem that I know I'll be coming back for are the jam-making classes. The area sports a number of berry patches - many right along the shore of the lake - giving up tasty blueberries and strawberries - all of which are perfect for making jam. A number of other classes offer visitors the chance to make their own soba or crafts, too! Just around the corner, we found the Oishi Tumugi Traditional Workshop. They offer classes on weaving and herbal dying as well as a window into the wonders of hand silk production and weaving. 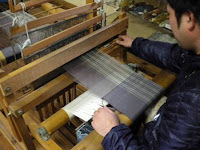 Four local artists work the looms and offer demonstrations of how silk fabric is made - from the worm to the kimono - that is utterly fascinating. Since we were there in the off-season we got a short, personal tour complete with demonstration. Hearty sunshine beckoned us to extend our tour up a rather steep hill, around a corner, and through a tunnel to Lake Saiko. Another of the Fuji Five Lakes, Saiko is smaller with a quieter, more intimate feel than Kawaguchiko. Outdoor opportunities abound (including an annual 10k run and marathon) and a small handful cafes and onsens offer refreshment for weary feet and bones. Kawaguchiko is an easy and direct bus ride (low carbon footprint!) from Tokyo's Shinjuku Station. Renting a bicycle is highly recommended for moving about the area in a fun, energy-efficient way, and most hotels and hostels in the area offer them. Sounds great. I'll add it to the trip list on my site if you agree to be the guides. Done! We're hoping to head back sometime in the Fall, if not for the race in June. Done! Your name is on the list, Russell! It was great. We really enjoyed our time there, and look forward to taking folks when they come for a visit. Or at least sending them off with a fairly detailed list of options. Everyday Gardens Up and Growing!